Durico Thermal Papers are Used for printing Video Images on the Diagnostic Ultrasound Device Monitor with Thermal Type Video Printers. 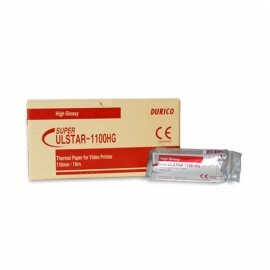 Durico Thermal Papers are Used for printing Video Images on the Diagnostic Ultrasound Device Monitor with Thermal Type Video Printers. Medical Image Printing requires high precision available from thermal printing method.Thermal printer uses heat to transfer an impression or image onto Thermal papers that are specially coated to make the paper surface sensitive to thermal impulses.As a kind of Medical Recording Papers, Printed Images are kept in patient’s record file before or after being reviewed by doctors. Do not store in a hot of humid place. Do not allow any volatile organic solvent or vinyl chloride. Do not touch unused paper with finger prints. Select the Paper Type Switch in your Printer to the type of Durico Papers. Tear Plastic Bag to get Paper Roll, and Remove the label attached to the top of the paper roll. Pull out the first 15 to 20 cm (6 to 8 inches). These first parts may have some dust, and cause poor print quality. Do not fold the paper or touch the printing surface. Dust or finger prints may cause poor print quality. Keep the paper in a dark, cool and dry place Otherwise the print may fade out gradually. Do not put volatile organic solvent, such as alcohol, om the surface of the printed paper. Do not put a fingerprint on the surface of the printed paper. Do not rub the printed surface hard. Do not cover the printed paper with a comercially available laminate. The lamination may cause the print dyes to smudge. It is recommended to store each printed sheet face up or to stack with a piece of paper between each sheet. This Product is not, in itself, medical treatment device. Do not use this Product it the plastic bag is torn, or any unused paper is blackened. Thermal printer head may be contaminated when used for long time. Dirty printer head may priduce streaks or spots. It is recommended that after printing 10 rolls or paper the printer be cleaned as per following instruction.